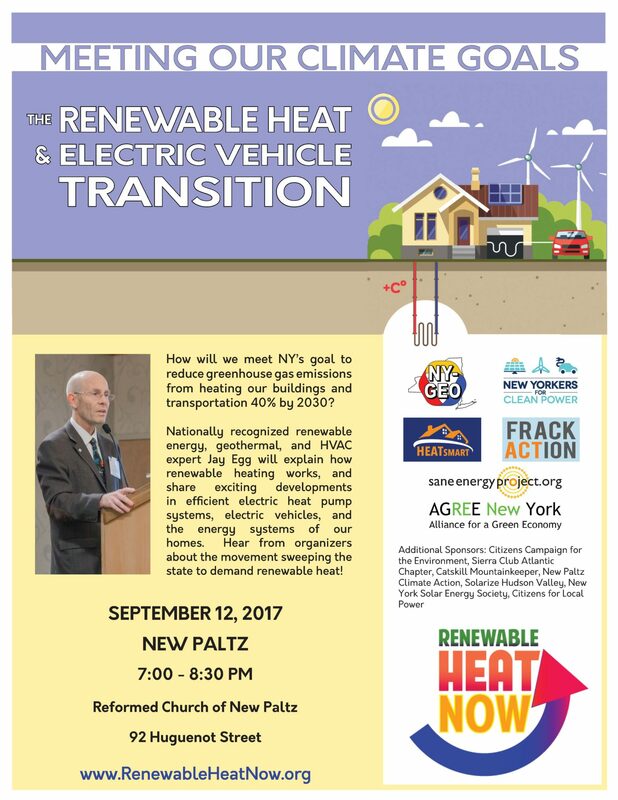 New Paltz: Energy expert Jay Egg to give free presentation on renewable-ready systems for heating and transportation – Renewable Heat Now! New Paltz, NY— What can we do to meet New York’s greenhouse gas reduction goals of 40% by 2030 when the majority of those emissions come from transportation and building heating and cooling? Nationally recognized home energy expert Jay Egg will give a free public talk on September 12, 2017 in New Paltz to explain the efficient electric technologies now available, such as geothermal and air source heat pumps, that allow homeowners to comfortably heat their homes without fossil fuels. The talk, entitled “Meeting Our Climate Goals: The Renewable Heat & Electric Vehicle Transition” will give homeowners insight into the options available to them. Advancements in electric vehicles will also be highlighted as part of Drive Electric Week. The workshop is locally sponsored by Catskill Mountainkeeper, New Paltz Climate Action, Citizen Action of NY, Sierra Club Atlantic Chapter, Citizens Campaign for the Environment, and Solarize Hudson Valley. It is part of a series of free public presentations across New York State organized by the Renewable Heat Now campaign. These talks are being given in conjunction with a series continuing education credit daytime workshops for HVAC experts and engineers. WHY: In New York, most people still use fossil fuels to heat our homes, contributing to 37% of the state’s greenhouse gas emissions. Transportation accounts for 39%, and both will have to be addressed in order to meet the goal of reducing greenhouse gas emissions 40% by 2030. There is currently a push to construct new gas pipelines across New York, which is being met by widespread opposition as the pipelines threaten the environment and public health, and build infrastructure that will only further contribute to climate change. Converting homes on expensive oil and propane to efficient electric heat pumps makes far more economic and environmental sense than building new pipelines. Jay Egg is a nationally recognized renewable energy speaker, expert consultant, instructor and author. Jay’s firm, Egg Geothermal is based in Florida. He started out as a design/build contractor in 1990 – so he’s grounded with very practical experience. He currently focuses his professional efforts as a national & international renewable energy expert. Jay is a training and curriculum writer/facilitator for the U.S. Department of Energy (DOE) and technical advisor to the New York State Energy Research and Development Authority (NYSERDA) on renewable heating and cooling. He is the author of two McGraw-Hill Professional books; Geothermal HVAC, Green Heating and Cooling and Modern Geothermal HVAC Engineering and Control Applications, and a columnist for numerous trade magazines including National Geographic Energy, and Commercial Architecture. Renewable Heat Now is a campaign organized by Alliance for a Green Economy, New Yorkers for Clean Power, NY-GEO, HeatSmart Tompkins, Sane Energy Project, and FrackAction. It advocates for accelerating the adoption of ground-source (geothermal) and air-source heat pumps in New York to reduce the amount of fossil fuels used to heat and cool our homes and workplaces. It educates the public about heat pumps. It also advocates for New York State policies that will enable all New Yorkers to afford to make the switch to these renewable-ready heating and cooling technologies. Drive Electric Week is an annual event that aims to increase awareness about the benefits of battery electric and plug-in hybrid cars. This year, there are nearly 200 events taking place across the country.